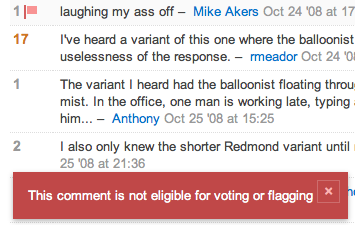 If the comments are not eligible for flagging, how did I just flag one? Here's a link to the comment I flagged. The red flag indicates that I flagged the first comment. The red error happens when upvoting any comment. Not the answer you're looking for? Browse other questions tagged bug status-completed flags comments locked-posts . Should I Comment After Flagging a Post? Is there any contradiction in both flagging as NAA and leaving a comment for newbies? Is it reasonable to flag a comment asking for upvotes? I successfully flagged a comment on a locked post!